Before sending something to a landfill ... or even before recycling ... can it's life be extended by using it again or in another way? Before buying something new, is there something that we already have that can be used? If we decide to purchase something, is there a "pre-owned" version available. Cans are perfect for holding all sorts of things. They can be used as pencil holders, vases, art supply containers, and planters. Plastic cups and utensils can be washed and reused for picnics, camping or eating around the pool. Plastic coffee containers make great planters ... just punch a few holes in the bottom and plant. The containers with a handle are perfect for hanging plants. We're growing habanero peppers in a blue Maxwell House container and it looks great ... and the peppers are thriving. Many restaurants use Tupperware-like containers to send food home with patrons. These containers are great for storing leftovers or filling and taking on a picnic or potluck. Aluminum foil can be washed and reused. Plastic non-dairy creamer containers also make great planters. Hang them upside down, poke holes in the sides and plant things like potatoes or beans ... the vines hang down and become beautiful patio plants with the added benefit of providing something good to eat. Plastic lids make great table top protectors for house plants. Jars are great for storing homemade sauces or salad dressings. They're also great for storing nuts, bolts and buttons. Spice bottles work wonderful for making up your own spice blends or storing summer herbs that have been dried. Pill bottles, once thoroughly cleaned, can do double duty holding seeds or small items. And talk about extending a life ... cars can be fixed up to run thousands of miles longer. Consider this ... for the price of a new car and the associated insurance, license tabs and emission checks, how many times could an existing car be fixed to extend it's life? In my opinion ... many times. We keep a container full of things that I just can't toss (surely there's a use for it that I'm not seeing). Later, when I need something, I go to that box in search of something that will work. Nine times out of ten, I find it. For example, in the spring I wanted to get some herbs started in the house. I looked in my box and found containers that originally held store-bought mushrooms. I put a few holes in the bottom and they worked perfectly as herb nurseries. Thrift stores ... today's thrift stores are stocked with almost new items. With an open mind and a little patience, one can find all kinds of bargains. Flea Markets and Garage Sales ... one person's trash is another person's treasure. Computer Recycling Stores ... amazing discounts on computers and accessories. They'll also take any computer stuff you want to get rid of, refurbish it and resell it. Online ... check out Freecycle, Craigslist, Amazon or Ebay for used items. Bulletin boards ... at church, school, the library or your community center. Trading parties ... I've read about trading parties cropping up around the country. Basically, a group of friends get together with items that they are tired of and ... they trade. This has especially worked well with clothing (remember trading clothes with your best friend as a kid?). And while it's not "owning" a book, consider the library the next time you want to read something. I hope that this post got you thinking creatively about how to reuse items in your home. Be watching for part three of this series ... Recycle. Kathryn Brennar is a communications coordinator for Friedland Realty, a commercial realty agency specializing in the lease and sale of Manhattan and Westchester office space. Friedland has held an exemplary standard of real estate knowledge and expertise for the past thirty plus years and continues to bring their customers the best in commercial real estate service. Building a green infrastructure is no longer a new idea. Going “green” is actually becoming quite popular. However, the ways that people go about doing it can be new and unique. City developers are beginning to incorporate some creative strategies of their own. Specifically, there has been a recent spike in the level of interest that communities have had in developing their parks and outdoor recreation areas, as well as housing and building complexes. While incorporating and maintaining them has always been an important priority, especially within densely populated cities, the latest trends show that community developmental plans are now incorporating “green” design. They are realizing that there is an opportunity to provide people with a necessary recreation area while creating a positive impact on the global environmental crisis. Currently there are a number of projects taking place in major metropolitan areas in an effort to reverse the negative effects that humans have had on the environment. One project that is currently gaining publicity is the green rooftop. Green rooftops utilize commonly unused space atop buildings and convert them into green zones, where gardens or turf are planted. These roofs help reduce the heating and cooling costs it takes to power a building, and also create a habitat for birds and insects. Additionally, green rooftops reduce the amount of contaminated runoff water that can collect in local sewer systems and waterways. Even major companies and organizations have taken notice and are beginning to implement similar environmental strategies. The Ford motor company installed a 450,000 square foot green rooftop on their new Dearborn Truck Plant. Recently studies have been preformed comparing green rooftops to conventional asphalt or concrete roofs and results show that temperatures on the green rooftops can be as much as 32 degrees lower than conventional black roofs. This proves that green rooftops could help reduce the “urban heat island effect,” which occurs when black top buildings absorb solar energy and radiate that energy in the form of heat. Another sustainability initiative that is becoming increasingly popular in urban (as well as suburban) areas is the rain garden. Rain gardens are planted near areas of high storm water runoff. Instead of allowing the excess water to travel into the sewer, (which can cause backup and increased water contamination) water flows into strategically placed gardens, thereby reducing overflow problems. Currently in the District of Columbia, the department of Agriculture has been spearheading an initiative to increase the number of gardens that are sustained by the community, termed “people’s gardens.” Rain gardens are amongst the initiative along with community vegetable gardens where the produce is donated to local soup kitchens. They are also contemplating rooftop bee hives to aid in the pollination of the plants. In Portland, Oregon local policy makers are taking another approach and creating Green Streets. A number of city and suburban streets were identified as being excessively wide and creating too much run off water. In response to this problem, Portland officials created curbside gardens that allowed for the collection of street storm water. The gardens collect water at the surface and disperse it amongst the vegetation thus allowing for a gradual and natural water filtration process to occur. While the public sector has started to take on green initiatives, private developers have also joined forces to implement change. Even though NYC is literally wall to wall with buildings, architects with a soft spot for the environment have been able to incorporate a green atmosphere in areas that many believe had no room left for design changes. On the West Side of Manhattan a new park built on the old High Line stands 30 feet above street level. Landscape architect firm, James Connor Field Operations, and Diller Scofidio + Renfro, worked with designer, Piet Oudolf, to create this elevated oasis. The architects were able to integrate vegetation into the existing structures left from the railroad to create a beautiful natural setting for locals and visitors. On the lower end of Manhattan stands another structure, The Visionaire, which focuses on bringing New York to the forefront of green initiative. Designed by Pelli Clarke Pelli Architects, it stands as the greenest residential skyscraper in the US. The architects incorporated a highly insulated wall system with insulated glazing and low energy reflective coatings. They also overcame the lack of horizontal space that New York buildings are allotted by successfully creating a number of terraces using green rooftop techniques. The building boasts a wastewater recycling system where all tainted water is cleaned within the building using a membrane filtration system and is then reused in the buildings toilets, green rooftops and cooling towers. Lastly, the building uses solar panels, a natural gas powered turbine and byproduct heat recycling amongst other energy efficient, low impact building and utility strategies. Cities across the nation are developing creative and effective solutions to our global sustainability problem. By creating and implementing a green infrastructure and building practices, urban and suburban communities can contribute to the overall “greening” of the planet. I'd like to thank Ms. Brennar for that interesting and informative article. This is part one of a three-part series on reducing, reusing and recycling. It originally "aired" in July of 2008 and I thought it was time to revisit the subject. To get us started, here’s a really wonderful, informative movie on “stuff”. It takes about 20 minutes to watch but … it’s really worth it. And after watching it, I hope you’ll pass it on to everyone you know. Ok … on to the subject of reducing. Reducing refers to lessening the amount of items or resources that are consumed, using only the amount that is needed, and looking for alternatives that will lessen our use. Here are some interesting facts: Even biodegradable items like food can hang around in garbage dumps for years. Trash is packed so tightly that it doesn't always get the necessary light, oxygen, and/or microorganisms it needs to decompose. Researchers have found 25-year-old corncobs and grapes, and 50-year-old newspapers that are still readable, in landfills. While our trash situation is a big concern, reducing isn’t all about the landfill. It’s also about not having so much stuff to begin with … stuff that takes natural resources to create. Most of us consume as though there is no end to our resources. But the truth is that our resources … things like water, gas, trees, food, minerals and metals … are either finite or being used so fast that it is impossible to keep up with the demand. Someday we’re going to run out. And that could mean the end of … us. We can run headlong into running out and see what happens (nothing good, I’m sure) or we can start limiting our consumption … and consuming smarter … so that what we have will last a lot longer. So how do we do that? Reduce! Reduce everything from our energy, water and gas consumption … to our purchases … to what we eat. Consider whether or not a purchase is really necessary … or is it just more stuff. When a purchase is made, consider the packaging and opt for bulk materials whenever possible. Purchase durable, long-lasting goods. Think about sustainability. Here’s a simple example: if we eat just one fish today, we allow the others to reproduce … providing us with fish for another day (that’s sustainability). If we eat all the fish today, however … we have none for tomorrow (that’s extinction). Starting today, take a look at everything you use … and use less of it. Watch for Part 2 of this series (Reusing) in an upcoming post. The other day, while walking along the river, I came to an area where Daffodils were blooming. They were beautiful! 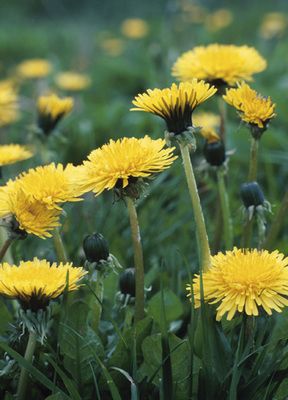 On the ground around them, Dandelions were also blooming. The affect was stunning ... masses of bright yellow Daffodils above a carpet of bright yellow Dandelions. A little later on my walk, I came upon lovely blue, purple and white flowers ... growing wild. The plants were healthy and thriving. Returning to our apartment complex, landscapers were out in force ... spraying chemicals on the lawn, riding gas powered mowers, cutting down trees and creating the perfectly manicured lawn. I thought ... what's wrong with this picture? We destroy beautiful plants (weeds) which grow without any care or maintenance and replace them with inefficient landscapes which require watering, fertilizing and a lot of care. Seems backwards, doesn't it? Lawns are only able to absorb about 1/10 rainfall ... the rest is runoff. The shallow root systems of grass are not able to stabilize the soil resulting in erosion. Pesticide use, to keep those lawns green and perfect, kills beneficial insects and birds. Some exotic, non-native plants invade an area, killing native vegetation (think Kudzo and Japanese Barberry). Lawns and exotic plants require up to 60% more water than native plants and typically don't survive droughts. Choose native plants for your landscaping. They are hardier than exotic plants and will require less water, fertilizer and care. Consider deciduous trees. They not only offer shade and beauty to a yard, they can also offer shade to your home. That, in turn, will cut down on cooling costs in the summer. In the fall, when they loose their leaves, the barren branches will offer variety and interest to the yard as well as allow sunlight to heat your home. Rather than planting a lawn, consider installing a woodland or use wild flowers to create a lovely meadow effect. With a little thought and planning, our yards can be beautiful and "Green". In northern Florida, in a favorite park, we once found beautiful carnivorous plants growing wild ... Pitcher plants (pictured), Venus Flytrap, and my favorite ... the small Sundew. It's illegal to take these plants ... their numbers have declined because of habitat loss and illegal poaching. They are also susceptible to pollution. In a recent Scientific American article, I learned that carnivorous plants are on the decline for another reason ... the insects which they "eat" are contaminated with cadmium ... and the cadmium is killing the plants. Cadmium is a metal and occurs naturally, in small quantities, in soil, water and air. As a metal, it doesn't break down and can accumulate over time. It's the build-up of cadmium that can be a problem ... in humans it can cause lung and kidney disease and make one's bones weak. In plants it appears to prevent growth, preventing any new shoots from developing. So, how do the insects become contaminated? Cadmium is released into the environment through the burning of fuel, making and using phosphate fertilizers, mining and metal processing operations, and disposing of metal products. When we burn fuel, cadmium is released into the air and eventually settles to the ground as a dust. Phosphate fertilizers contain cadmium which is transferred to plants through the soil. Through mining and metal processing, it is released into both air and water ... and disposing of products containing cadmium (some rechargeable batteries, paints, plastics, Ceramic ware, etc.) causes air, water and soil contamination. Once it gets into the environment, insects ingest it. And that brings us back to the carnivorous plants. It may seem like a small thing ... many people have never even seen a carnivorous plant. But as I've said before, what happens to us when plants and animals become extinct? And if plants, out in nature, are showing a build-up of a metal like cadmium, how long will it be before we are suffering the affects of cadmium contamination? The struggling plant population is another wake-up that our actions have consequences. When we are next tempted to just toss a recyclable battery into the garbage or burn household waste ... when we feel like driving long distances or fertilizing our yards ... let us remember the plight of the carnivorous plant and remember that our actions matter. For more from Simon Marshland, please visit his site "Simon Says". For more information on writing, please visit "The New Author". And as always ... I'd love to hear from you! Each month, on the first Friday of the month, I post a vegan recipe. If you're wondering why a blog about "green" living posts recipes ... well ... eating vegan/vegetarian foods is one of the easiest (and tastiest) ways to walk a little gentler on the earth. If you'd like to read more about that, please click HERE. This month's recipe comes from my bloggy friend Tracy from Strawberry Hedgehog. I first got to know Tracy through her vegan soaps ~ seriously luxurious bars of pure decadence. Reading her blog, I've learned about the benefits of Shea butter, how certain essential oils have healing properties and ... received wonderful vegan recipes. This recipe would be perfect for an Easter brunch or a special breakfast for Mom on "Mother's Day" ... or, just anytime that a delicious treat is in order. A big thanks to Tracy for graciously sharing it with us! I hope you and your family enjoy it! Preheat oven to 375 and lightly oil a muffin tin. Whisk together flour, baking powder, sugar, and salt. Make a well in the center and mix with almond milk, water, oil, juice, and zest. Fold in frozen blueberries. Fill the muffin tins half way, sprinkle with turbinado sugar and bake for 20-25 minutes. (Large muffin tins will take the full 25 minutes or a little longer, if you opt for fresh berries, check them earlier). Allow them to cool before attempting to remove (I usually cheat and pop the entire muffin tin in the freezer for a few minutes so they’re easier to handle and remove.. yes, I am that impatient when there are yummy goodies involved).